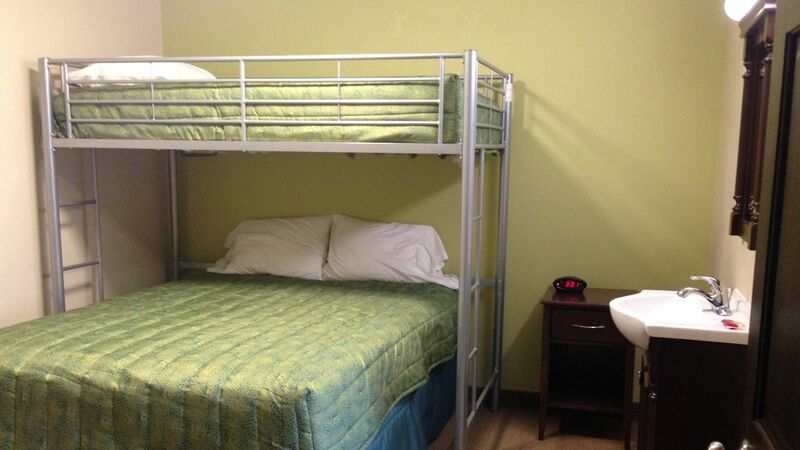 We offer a wide variety of rooms at affordable prices. 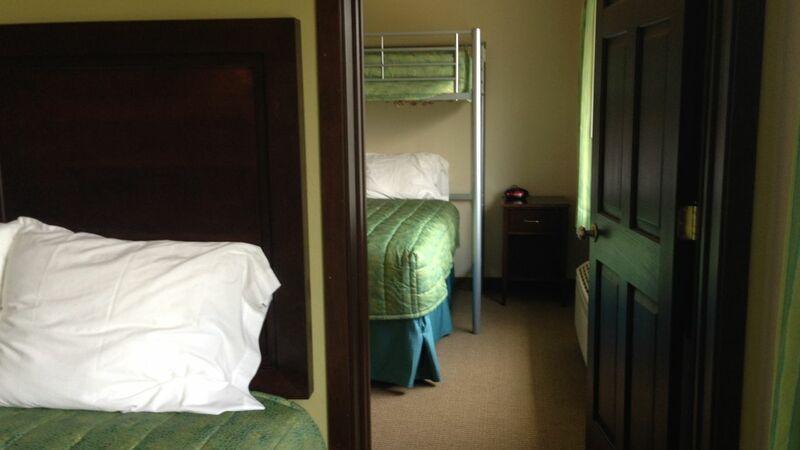 Our Lodge Rooms have 2 Queen Beds. 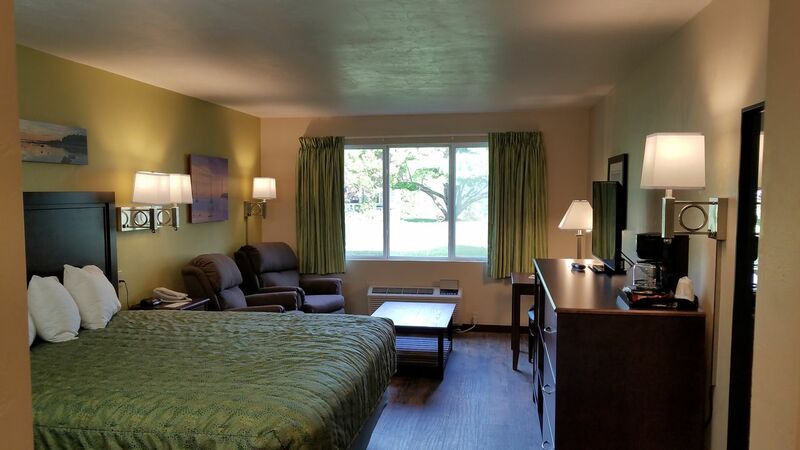 We also offer kitchenettes, king rooms, and suites with fireplaces. FREE Wi-Fi is available. Bike racks are located in front of each building. Some two and three night minimum stays may be required. All of our rooms and suites are non-smoking. Sorry, we are unable to accommodate your pets. Our Lodge Room, which has two Queen Beds, flat screen TV, A/C, split bath with tub/shower, refrigerator, microwave, and a coffee maker. 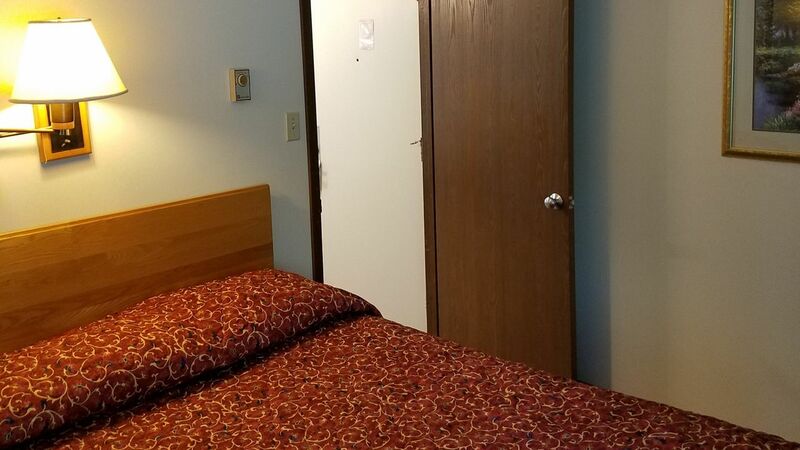 Some rooms of this type are adjoining and are available upon request. These rooms are located on both the first and second floor. This room can sleep up to 4 people. 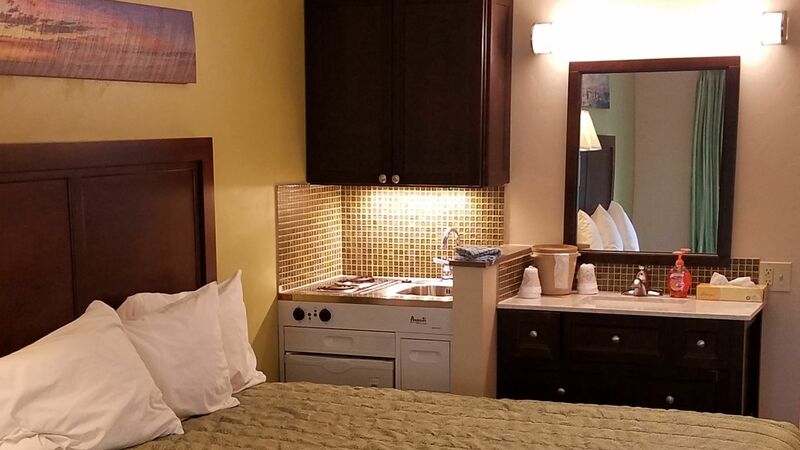 Our remodeled Kitchenette Room, which has two Queen Beds, flat screen TV, A/C, split bath with tub/shower, two burner range, pots, pans, dishes and silverware, refrigerator, microwave, and coffee maker. 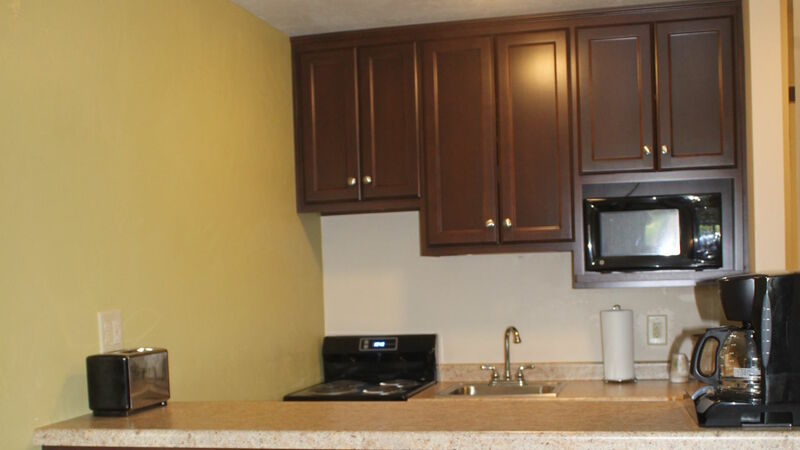 All of our Kitchenette rooms are on the first floor. Adjoining rooms available upon request. This room can sleep up to 4 people. 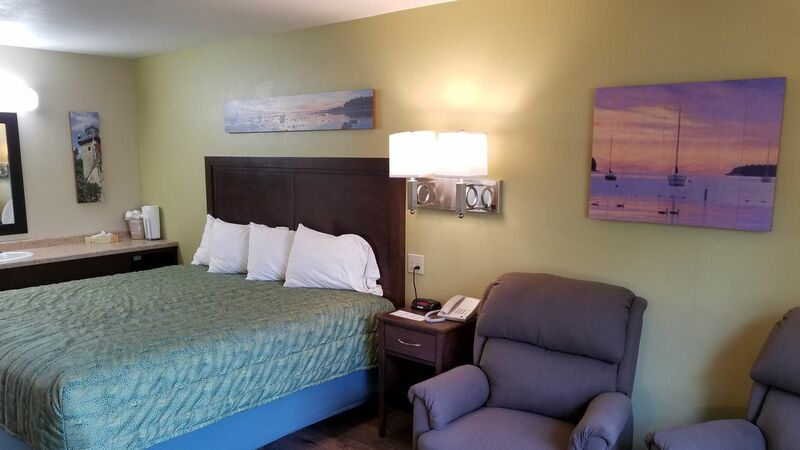 Our remodeled King room, which includes a King Bed, love seat (2nd floor) or two recliners (1st floor), Flat Screen TV, A/C, split bath with tub/shower, refrigerator, microwave , and coffee maker. Our King Rooms are located on the first and second floor. 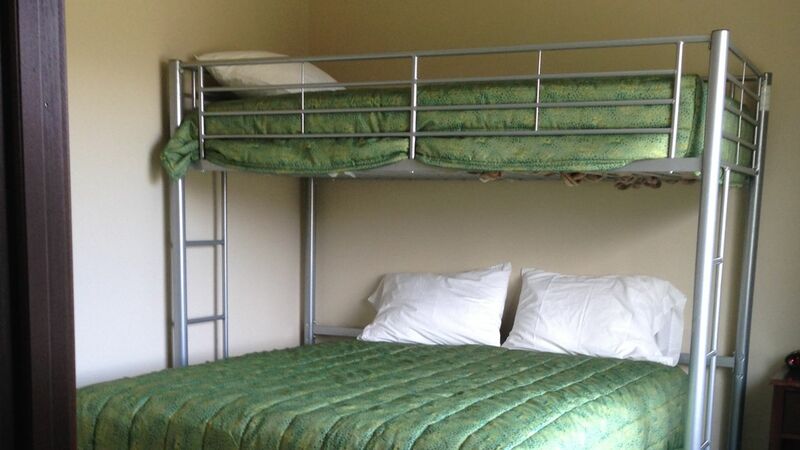 This room can sleep up to 2 people. 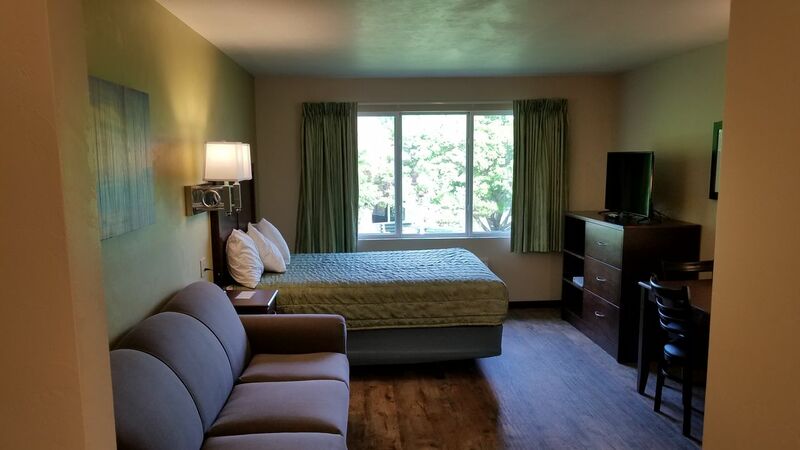 **Remodeled in 2019** The King Suite has a King bed in a private bedroom, and a queen sofa sleeper in the living room. 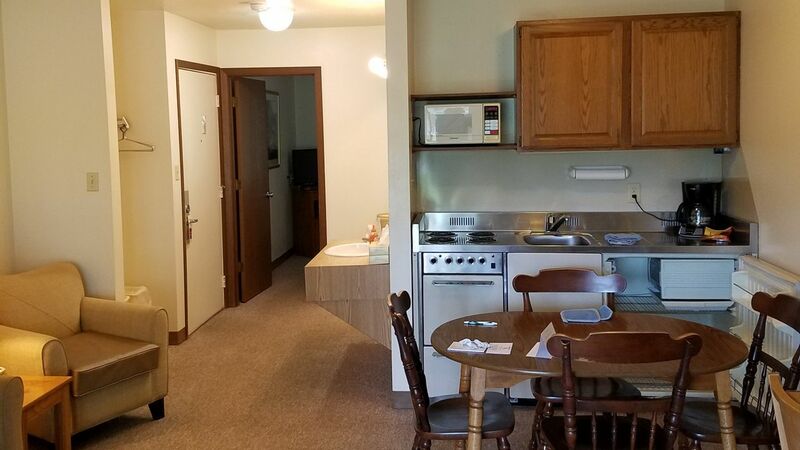 This suite features flat screen TV’s in both the bedroom and living room, a kitchenette (4 burner range top, oven, small refrigerator, microwave, and coffee maker), pots, pans, dishes, and silverware. There’s also a dining table with four chairs, and an electric fireplace! 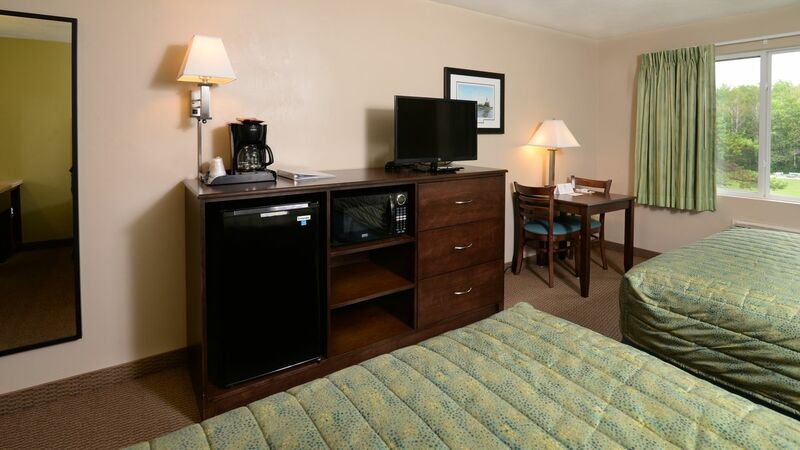 Our One Bedroom King Suites are located on the First Floor. This suite can sleep up to 4 people. This remodeled Family Room has two queen size beds in one room and a queen/twin bunk in a second private room. 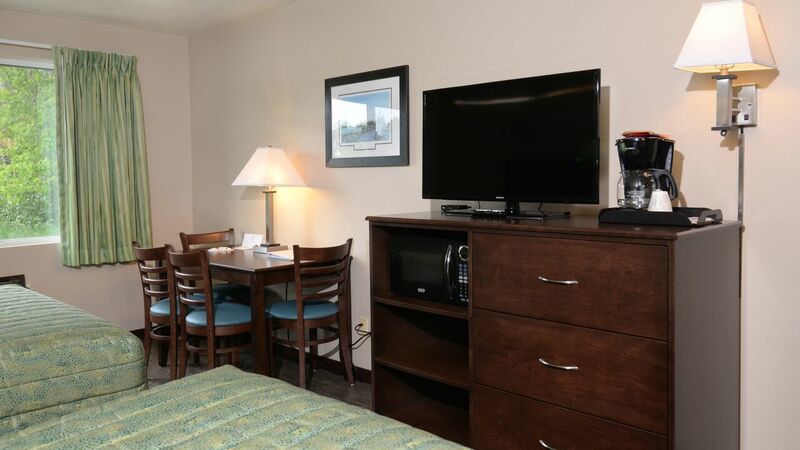 There is a flat screen TV & A/C - Heater in each room. 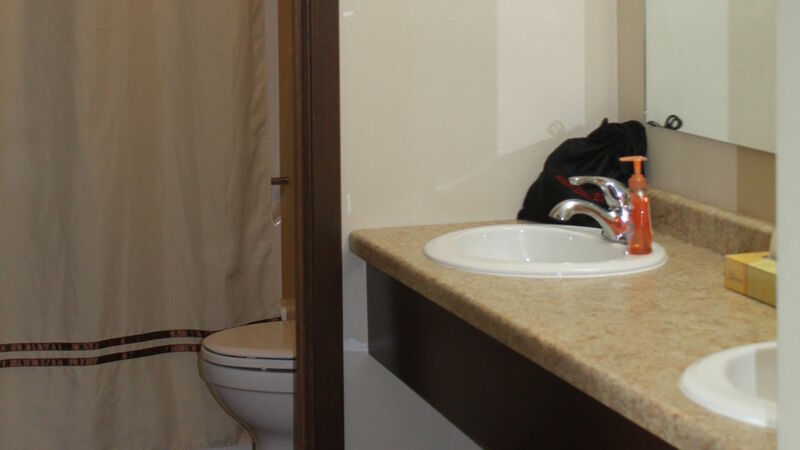 In the main room, there is a microwave, refrigerator, coffee maker and split bath with tub/shower. This room has 1 full bathroom. This suite can sleep up to 7 people. For additional guests, an adjoining Lodge Room is also available. This unit is on the second floor. 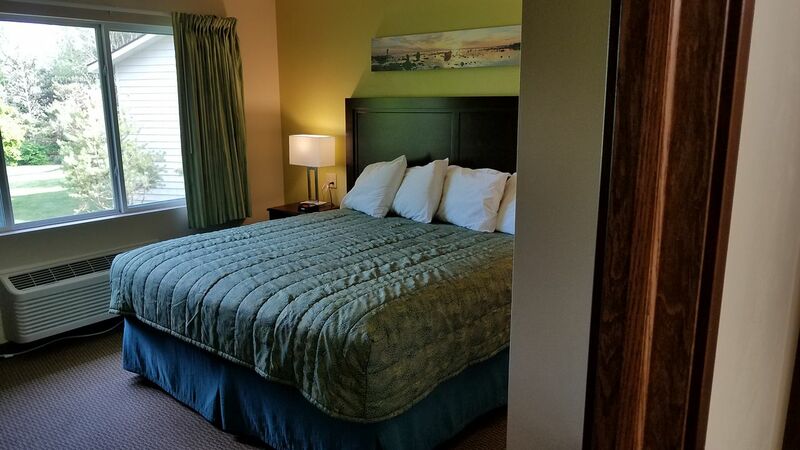 This remodeled Family Room has two queen size beds in one room and a queen/twin bunk in a second private room. 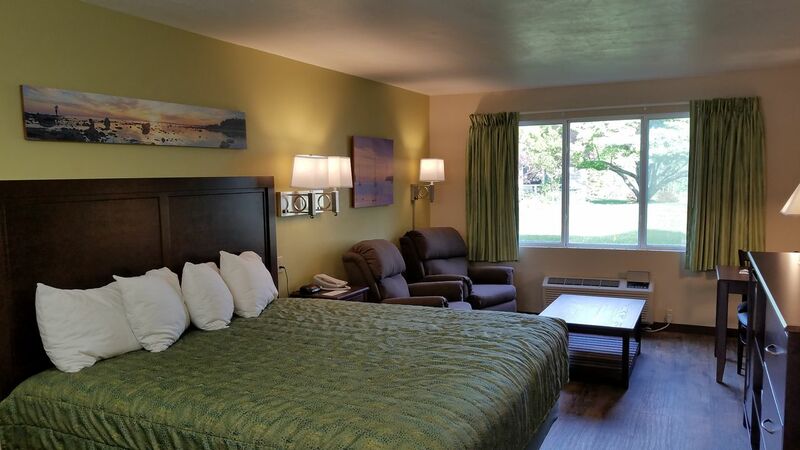 There is a flat screen TV & A/C - Heater in each room. 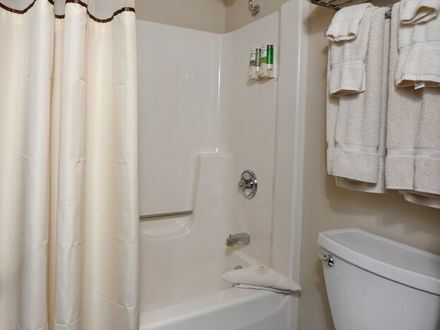 In the main room, there is a microwave, refrigerator, coffee maker and split bath with tub/shower. 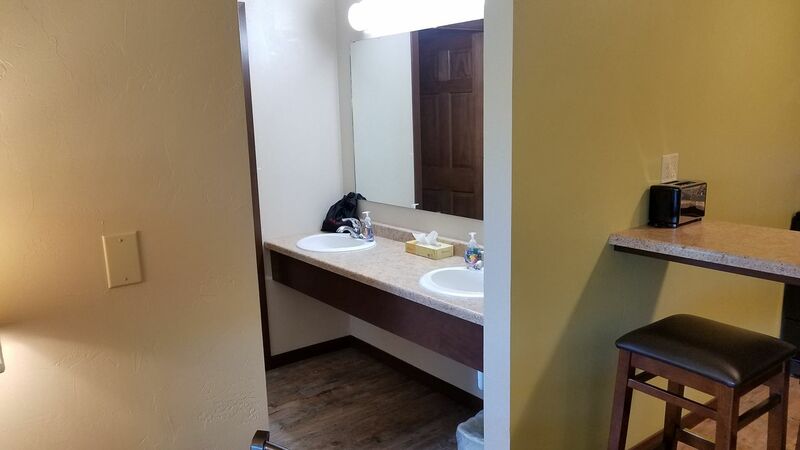 This room has 2 full bathrooms, with the second bathroom having private access from the second bedroom. This room can sleep up to 7 people. This unit is on the second floor. 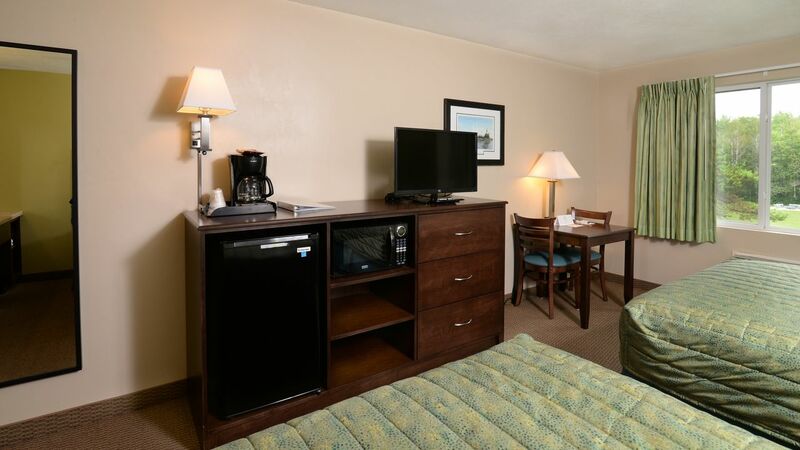 This remodeled Family Kitchenette Room has a King bed in a private bedroom, with a flat-screen TV, heat and A/C. In the Living area, there is a Queen Size bed, and a Queen Sofa Sleeper, flat screen TV, heat and A/C. 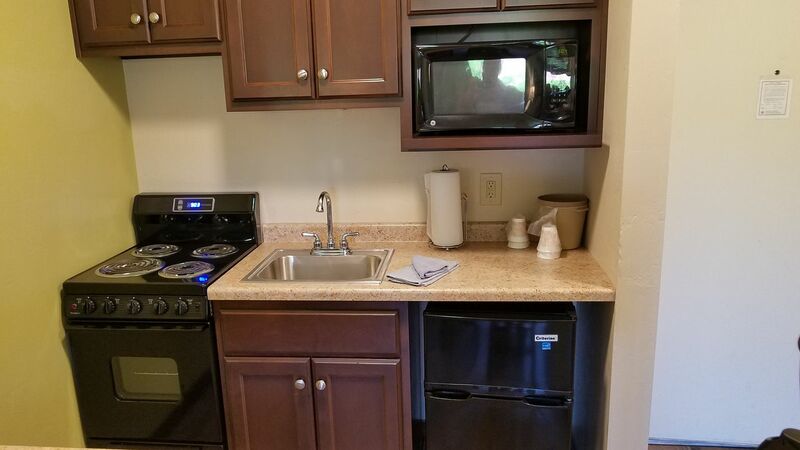 The Kitchenette has a 4 burner cook top, oven, small refrigerator, microwave, coffee maker, and pots, pans, dishes, and silverware. There is 1 split bath (tub/shower) with a double vanity, to make getting ready to start your day a breeze. The room can sleep up to 6 people. This unit is on the second floor.